As if that title can’t get any longer, I was going to add the word Photo between the words Chalkboard and Frame. 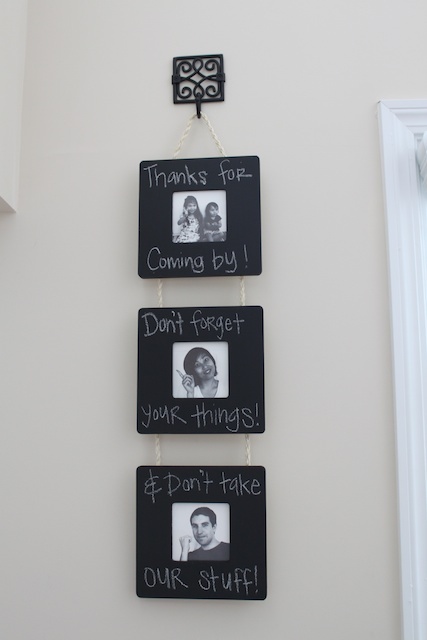 Or I could have just called it my Goodbye Chalkboard Frames. Whatever you want to call it, it was so simple to make. I found these unfinished frames at Michael’s for $1 each. But I had a coupon that made them $0.80 ea. I thought they would make for some fun frames around the house. One thing lead to the other and I ended up with this idea. We have it hanging on a hook that I found at the thrift store for 50 cents. It worked out perfect. This thing is hanging at our front door. Everyone will see it on their way out. The pictures, I will need to reprint them. I used our home printers for these because I didn’t have time to get them printed professionally. Hanging it at that spot near the front door was a bit tricky because of the location of the light switch. I would have liked the frames to hang a little lower. But oh well. You do what you can right? If you made something inspired by Simply Modern Mom, please upload pictures of it in our Flickr group to show it off to everyone. 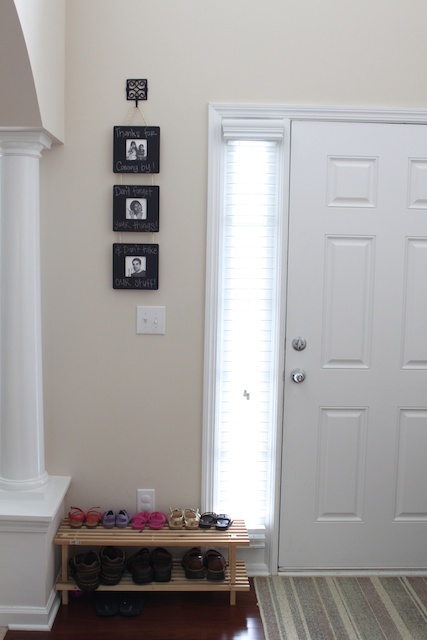 You may be featured on Simply Modern Mom. 1. Clean the frame surface. 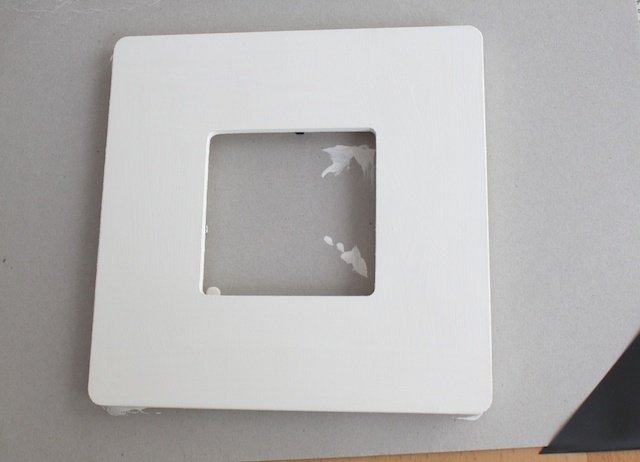 Then paint 1-2 layers of primer. Allow to dry completely. 2. 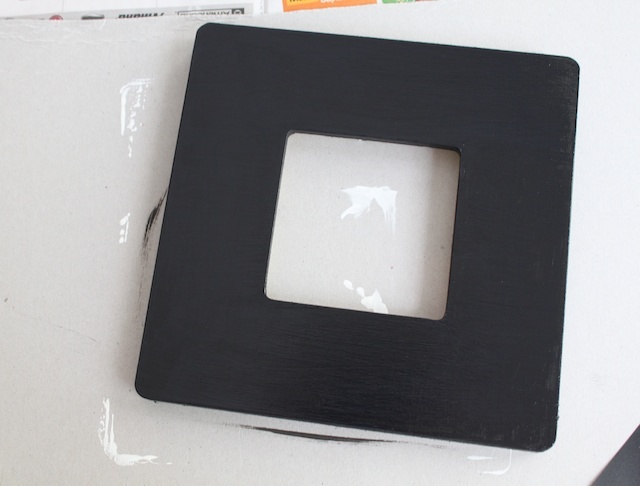 Paint a thick layer of chalkboard paint over the primer. Allow to dry for at least 24 hours before using chalk on it or putting a second layer if necessary. I only did one thick layer on mine. When it dries, it doesn’t feel scratchy like regular green chalkboards. But it works great as a chalkboard and erases using regular chalkboard erasers. 3. Cut the length of your ribbon, twine or rope to your desired length. Have a long piece for the hanging at the top. I used twine I found at the Dollar Store. 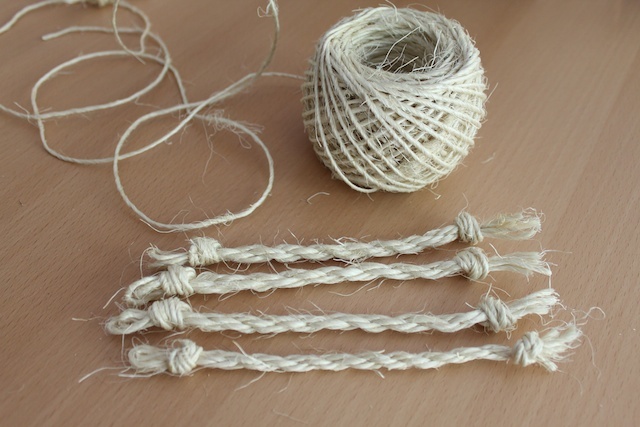 I tied six strands and twisted it to make rope. 4. 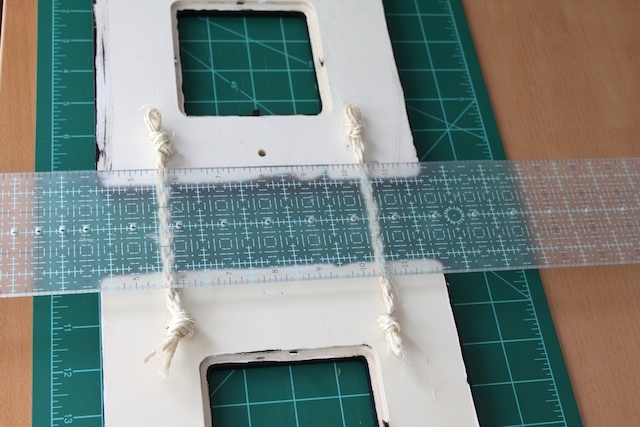 Once the chalkboard paint dried (the paint I used said to wait 24 hours), I turned to the back of the frames to attached my twine ropes. 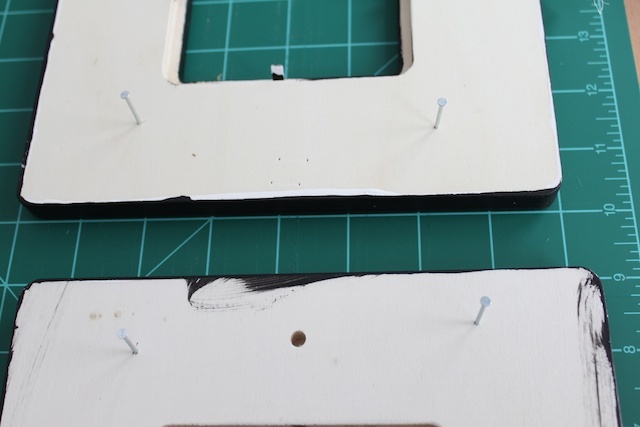 I measured the distance between frames and marked places where I needed to nail right under the knots. 5. Hammer the nails in place. Then use the hammer to bend the nail to keep the knots in the rope stable. 6. 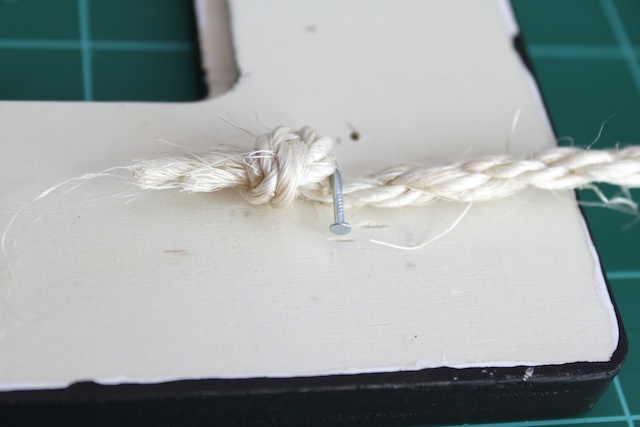 Place the rope in place with the knot right on the other side of the nail. Then hammer the tip of the nail down to bend it completely. You can also use super glue or E6000 to glue ribbons in place. 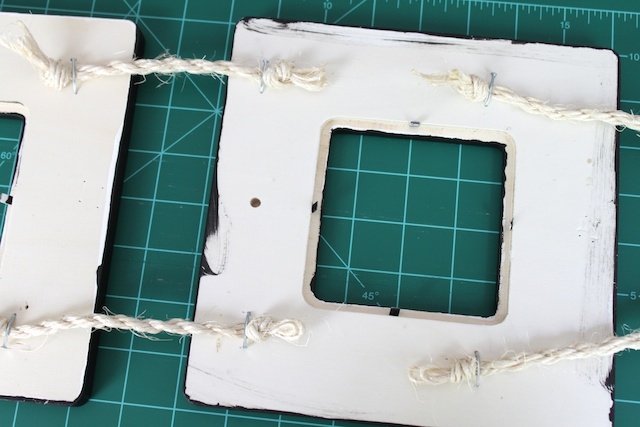 Or screw eyes to tie rope or ribbons to connect each of the frames. 7. 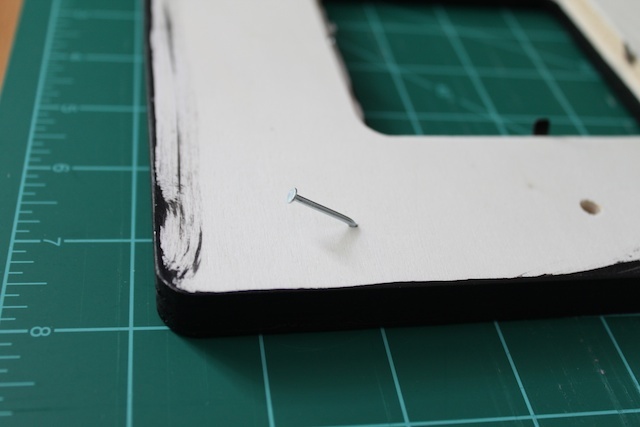 Cut pictures to fit the frames and place them in the frames. The frames I used didn’t have glass. 8. 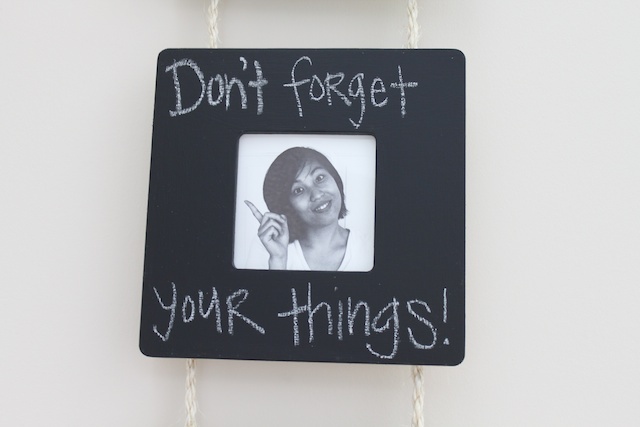 Use chalk to scribble notes, reminders or photo captions. 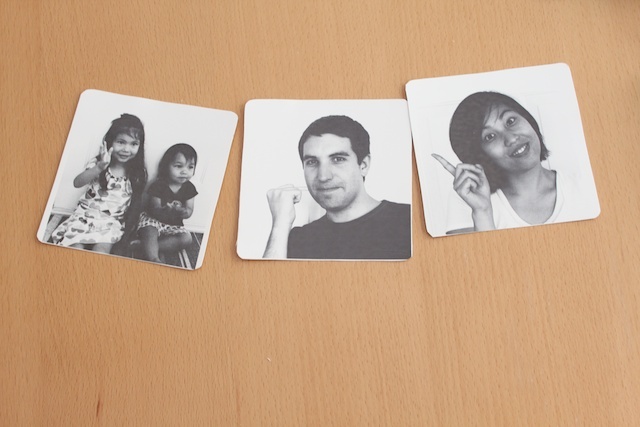 Switch out the photos every once in a while to write new captions or speech bubbles. » Tell me… Have you used chalkboard paint before? What kind of projects have you used chalkboard paint on? You can tell I’m serious about people not taking our stuff by my almost laughing trying to look mean face. That is so cute! You are so creative. I love it! I LOVE chalkboard paint! LOVE IT! Our entire pantry door is covered in it so we can use it for a shopping list, menu and place to draw, write lists, etc. The side of the bookshelf in the playroom is painted with it too and I’m contemplating a new project using it but I kind of think it may be getting a bit excessive. 🙂 Love the frames though! They’re great! I am totally stealing this idea! I love it! 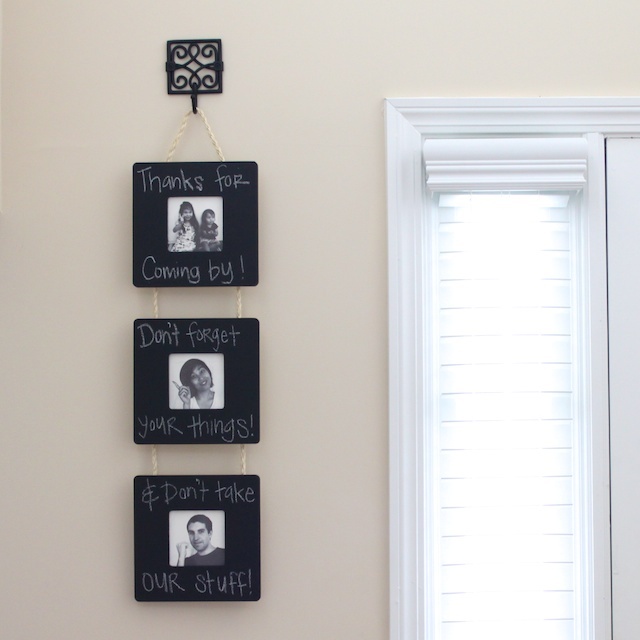 I’ve never used chalkboard paint, but I love this idea. So cute. What a great idea. I painted contact paper with chalkboard paint and put it up on the end of one of my kitchen cabinets. I write quotes on there periodically. Now I have a bunch of leftover paint for projects! That is great!! 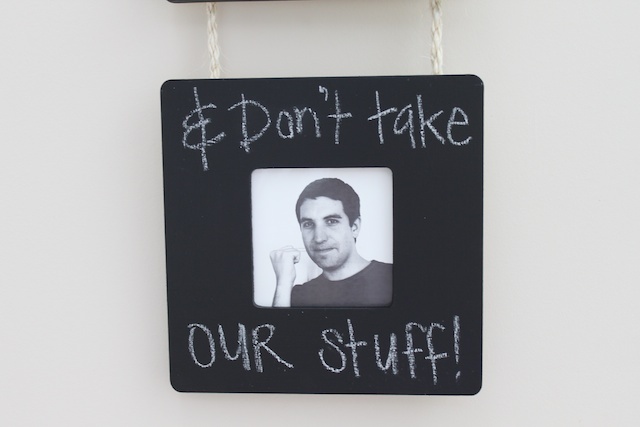 What a clever idea, and I Love the don’t take our stuff. hehehe had me giggling. What a great idea! I have a can of chalkboard spray paint that I bought a few years back. I meant to use it in my daughters’ room so they could play and draw, but I never did. I just found the can while cleaning. Now I have something to use it for. Thank ya! Ikea. And they are pretty cheap too. We use these in our closets too.